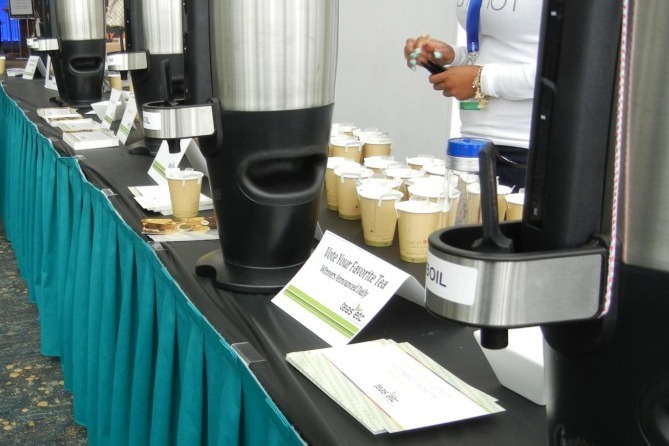 In the lobby at the Long Beach Convention Center this morning, there were three tables set-up for tastings of teas at the World Tea Expo. So, I obliged by tasting a dozen different teas to begin my tea education. I started with International Tea Importers‘ table, where they were serving Waterfall teas from a pot and pouring into plastic shot cups. I started off with Waterfall’s Orange Ginger White, which was pleasant, then had the Passion Fruit Oolong, which had a lovely nose, and then finished off with English Breakfast, which is a black tea and was noticeably strong. 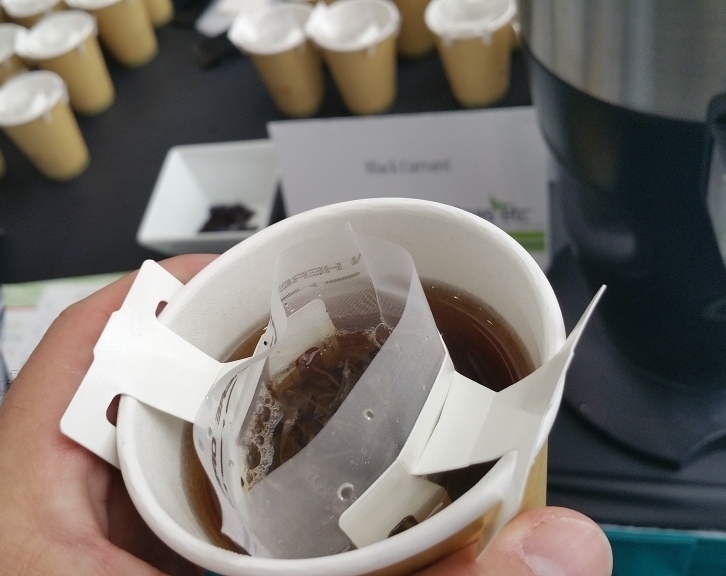 I then moved on to Teas, etc‘s booth, which featured a nice set-up with the tea leaves in little holders that fit greatly into cups wherein one poured boiling water and could easily toss away the holder when one was done steeping. I started off with the Tahitian Vanilla Rose, which was an Oolong tea and was very soft, especially effected by the rose flavor in it. Next, I had the incredibly gorgeously-nosed Black Currant, which was a black tea, and, while it did not taste quite like its nose, it was certainly enjoyable. Next up, I tried the Shui Xian Organic, which is an Oolong, although not my style (perhaps it was very earthy?). Finally, I had the Chocolate, which was a Pu-erh, and had a smooth chocolatey-ness to it. Nevertheless, the Black Currant was definitely my favorite amongst their offerings. Also of note was that Teas etc utilized a nifty holder for the tea leaves that was easily removable and that did not fall in so easily. That was pretty neat. Finally, I visited the The Tea Spot‘s table, where they were offering tasting of ten of their teas. Since that seemed quite daunting to try all of them, I tried half of them. I started off with Meditative Mind, which is a white tea sprinkled with rosebuds and jasmine; I found it to be pleasant. I then went in a very different direction next with Bolder Breakfast, a Pu’erh tea blend with chocolate. I am just beginning to learn about this particular style, which takes getting used to, due to its earthiness. After that, I went to a calmer tea with their Blood Orange, which was a creamy blend of red rooibos & orange peel and I found it to be a nice calm after the Bolder Breakfast. I then finished off with two quite caffeinated teas, beginning with Climber’s High, a blend of black, green and white teas with chai spices, which I found to be good and enjoyable for a tea. I then ended my tea drinking with their Earl of Grey, a sweet twist on the traditional black tea blend, using licorice root (no, it did not taste like anise); I quite enjoyed this tea and was glad to end my tea-tasting this morning with that taste in my mouth. 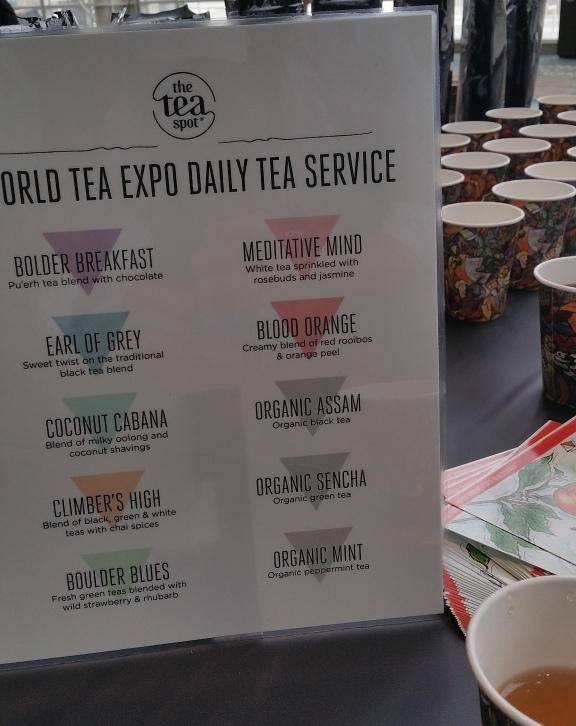 Looking forward to tasting more teas tomorrow morning as the World Tea Expo continues.